Do we know why we are raising our children to speak more than one language? I sometimes wonder what ever happened to doing something for its intrinsic value, for its beauty and the inspiration that it provides. Do we only read books because they will help us make more money? Do we only take classes that will help us advance in our career? Why do we often fall into the trap of believing we need a compelling financial or career-oriented reason to pursue something? I will be the first to admit that I'd be delighted if raising my children bilingually and biculturally will aid them financially down the road. And I can understand why earlier generations didn't speak a second or third language when they were told that speaking a different language at home with their children could cause confusion or, at the very least, put their children at a disadvantage. I am sure I would have questioned why the experts were recommending against it but I probably would have felt pressured to not go against their test results and recommendations. Out of fear of doing something to disadvantage my children, I very likely would have caved under the pressure. Facts are facts, right? * Local dialects are disappearing around the world. A major effort has been underway for a while now to revive the dialect. This is happening around the world as dialects and languages are falling into disuse and disappearing. As we all know, children will learn a language if they feel there are necessary reasons to learn and use it. Keeping a language alive as an academic exercise is wonderful but it will not truly keep a language, and the intertwined culture that goes with it, alive. * The older generation, who often still speak the dialect, have not been able to overcome their habit of not speaking the dialect to the younger generation. Part of this comes from a subtle gut response: if the person they are speaking with is younger and especially if he or she does not sound like a native speaker of the dialect, then the older person automatically switches to High German. * Children who are now being taught the dialect in schools are lacking the cultural associations that go along with a language. They are learning the dialect as an academic pursuit. At least there are grandparents around who grew up speaking the dialect but as mentioned above, it does not come naturally that they, and the older generation in general, will speak it comfortably with these students learning it for the first time. Especially with something like a dialect, learning the language purely in school is more sterile and limiting. Nevertheless, it is definitely better than nothing! Language is a sensory being. It exists within the medium of life, within the medium of context. It takes on the characteristics of its surroundings and landscape. If we want the language that our children learn to be sterile and flat, then we should make sure NOT to provide them with any stimuli other than the static words. If we only see language learning as the means toward a financial goal or success in terms of a better job, then there is no need for us to make language learning fun or part of our lives. In fact, if this is our motivation, then it would probably be best that we not even be involved in the language learning of our children since we might confuse the issue and actually provide an emotional context that would only muddy the issue later. My sincere hope, however, is that we want more for our children than simply financial success and a successful career. My hope is that we can't help but be motivated by more powerful visions for our children's lives. My hope is that we long for our children to experience our language for what it is - to taste it, to savor it. If this is our desire, then we must remember that we are an important link in this coming to fruition. No, we must remember that we are THE most important link in this coming to pass. We need our children to grow up not only hearing the language. Our children must be given opportunities to live the language, live the culture, live a life imbued with our languages and cultures. I firmly believe that it is important that we should allow ourselves to ignore the financial and career gains that our children might reap by learning our languages and to focus more on living our languages and cultures to the fullest. Most importantly, we should remind ourselves of the influence we have on one another. What we say to other families about why we are raising our children multilingually and multiculturally has a strong influence. 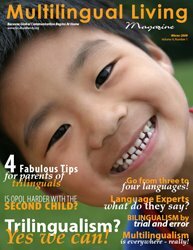 Encourage other families raising multilingual children to focus on the beauty of life and the sheer joy that multilingual living provides us! Live a life less ordinary! Live a life so full of language that you will forget that your children are indeed benefiting in other ways.